Location: Hotel "Kompas" is situated 650 m away from the beach area in a beautiful and calm part of Albena. 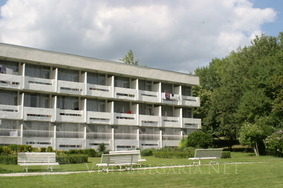 It is a 3 floor building with rooms for smokers and non-smokers. Guests can use the lobby bar, restaurant, change, pool for adults and children. With extra charge one can hire safe or fridge. There is a shuttle bus, that is going to the sea every half hour from 9,30 to 17 h.
The hotel was renovated in 2007-08. Accommodation: The hotel has in total 118 double rooms, 42 double rooms with connecting door, 5 single rooms and 5 apartments – totally renovated in 2008. All rooms are comfortably furnished, air conditioned and equipped with bath with shower, phone, and cable TV. All are with balcony. Apartments are with two rooms – living room and bedroom. Wine & Dine: Guests of the hotel are having their meals in restaurant "Kompas", which offers a unique buffet style table with variety of dishes for every kind of choice. The main hall is for non-smokers. There are theme evenings and a-la-cart service. - Table tennis, beach volleyball and football, basketball, step aerobics, aquaerobics, darts, chess, backgammon. Services subject to additional payment: Safe on the Reception; Beverages on the menu and all tobacco Products; Tennis, ,Surfing; Horse riding school; Children club; SPA center.